Chinese No. 1-ranked amateur golfer Jin Cheng, of Beijing, was crowned champion of the 2015 Asia-Pacific Amateur Championship after high winds and heavy rainfall from a nearby typhoon forced the cancellation of the final round at The Clearwater Bay Golf & Country Club in Hong Kong. The first group teed off as scheduled at 6:40 a.m. with nine groups making it on course for the start of round four. Play was subsequently suspended at 7:41 a.m. With conditions not improving by midday, Cheng, the 54-hole leader, became the winner over joint runners-up, Ryan Ruffels and Cameron Davis of Australia. Cheng opened the championship with a course-record 8-under 62 in the first round, followed by rounds of 68 and 69 to finish at 11-under 199 to earn an invitation to the 2016 Masters Tournament. His victory also secured his place in The Open Qualifying Series for The Open Championship along with Davis and Ruffels, who each finished at 10 under par. 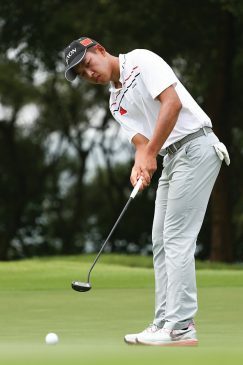 At 17 years old, Cheng managed to retain his place at the top of the leader board at the end of round three thanks to a superbly judged chip at The Clearwater Bay Golf & Country Club’s par-5 closing hole, from which he went on to secure a decisive birdie. With his win, Cheng became the second player from China to lift the AAC trophy following the triumph of Guan Tianlang in 2012. The 2015 AAC marked the first time the championship was held in Hong Kong. The Clearwater Bay Golf & Country Club is located in the New Territories and situated on a peninsula with stunning views of the South China Sea and Hong Kong. The golf course is divided into two parts: the Highland Nine and the Ocean Nine. Inclement weather caused delays in play throughout the week – during the morning of the first round and briefly in the late afternoon of the third round. High winds and heavy rainfall due to a nearby typhoon also resulted in suspended play in the morning of the final round. When conditions did not improve by midday, the fourth round was ultimately cancelled.